کرم زاده, لیلا, ربیعی, محمود, جمشیدی اول, حامد. (1395). بررسی زیست فعالی پوشش های شیشه- سرامیک SiO2-P2O5-CaO-ZrO2 بر روی فلز زیرکونیوم به روش سل- ژل. نشریه علوم و مهندسی سطح, 12(27), 93-103. لیلا کرم زاده; محمود ربیعی; حامد جمشیدی اول. "بررسی زیست فعالی پوشش های شیشه- سرامیک SiO2-P2O5-CaO-ZrO2 بر روی فلز زیرکونیوم به روش سل- ژل". 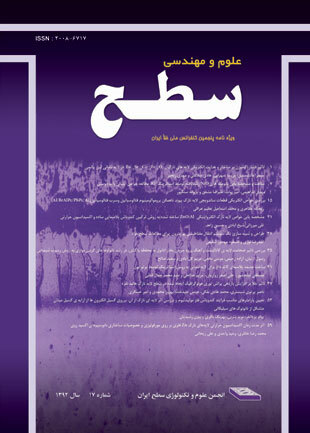 نشریه علوم و مهندسی سطح, 12, 27, 1395, 93-103. کرم زاده, لیلا, ربیعی, محمود, جمشیدی اول, حامد. (1395). 'بررسی زیست فعالی پوشش های شیشه- سرامیک SiO2-P2O5-CaO-ZrO2 بر روی فلز زیرکونیوم به روش سل- ژل', نشریه علوم و مهندسی سطح, 12(27), pp. 93-103. کرم زاده, لیلا, ربیعی, محمود, جمشیدی اول, حامد. بررسی زیست فعالی پوشش های شیشه- سرامیک SiO2-P2O5-CaO-ZrO2 بر روی فلز زیرکونیوم به روش سل- ژل. نشریه علوم و مهندسی سطح, 1395; 12(27): 93-103. زیرکونیوم وآلیاژهای آن کاربرد فراوانی در پزشکی ارتوپدی داشته و در مقایسه با فولاد زنگ نزن ،تیتانیوم و سایر فلزات مورد استفاده در ساخت ایمپلنت ها، از استحکام و مقاومت به خوردگی بیشتری برخوردار است. در این تحقیق شیشه سرامیک SiO2-P2O5-CaO-ZrO2 باروش سل ژل برروی فلز زیرکونیوم پوشش داده شد. زیست فعالی پوشش های ایجاد شده با غوطه وری در محلول SBF مورد بررسی قرار گرفتند. نمونه های آماده شده قبل و بعد از غوطه وری در محلول SBF به کمک تکنیک پراش پرتو ایکس (XRD) و طیف سنجی مادون قرمز (FTIR) مورد آنالیز فازی قرار گرفتند. کیفیت ومورفولوژی پوشش توسط میکروسکوپ الکترونی روبشی SEM بررسی شد. نتایج نشان می دهد که با جایگزینی کلسیم توسط زیرکونیم، ساختار آپاتیتی به دست آمده را می توان به صورت Ca10-xZrx(PO4)6(OH)2 در نظر گرفت. همچنین پوشش شامل ذرات بسیار ریز بوده و با افزایش مقدار زیرکونیا پوششی همگن و یکنواخت با تخلخل های کمتری حاصل می شود. G.Orive, E. Anitua , J.L. Pedraz, Biomaterials for promoting brain protection, repair and regeneration, Neuroscience, 10 (2009) 682–692. P.M. Galletti , and J.W. Boretos , Report on the Concensus Development Conference on Clinical Applications of Biomaterials, Biomedical Materials Research , 17 (1983) 539-55. J.M. Anderson, The future of biomedical materials, Materials Science: Materials in Medicine , 17 (2006)1025–1028. N. Nabian, M. Jahanshahi and S. M. Rabiee, Synthesis of nano-bioactive glass–ceramic powders Andits in vitro bioactivity study in bovine serum albumin protein, Molecular Structure., 998(2011) 37-41. I. Zhitornirsky, Electrophoretic hydroxyapatite coatings and fibers , Materials Letters , 42(2000) 262. L. Hench, L. Julian, R. Jones, Biomaterials: Artifical Organse and Tissue Engineering, CRC Press , UK (2005). F. Karl-Heinz, M.S. Klaus, Metallic Biomaterials in Skeletal Repair, European Trauma , 2(2006) 149-159. D. M. M. Bornstein, S. Berner and D. Buser., bone Opposition to a Titanium –Zirconium Alloy Implant ,as compared two other Titanium –Containing Implants, European cells and materials, 23(2012) 273-286. Alessia Basso , Sylvain Roy , André Mermoud, Biocompatibility of an x-shaped zirconium implant in deep sclerectomy in rabbits, Graefes Arch Clin Exp Ophthalmol 246(2008) 849–855. Y.Tsutsumi, D.Nishimura, H.Doi, N.Nomura, T. Hanawa, Cathodic alkaline treatment of zirconium to give the ability to form calcium phosphate, Acta Biomaterials, 6(2010) 4161-4166. O. Andriotis, O. L. Katsamenis, D. E. Mouzakis, and N. Bouropoulos, Preparation and characterization of bioceramics produced from calcium phosphate cements, Materials Science, 5 (2009) 22-27. J. Gallardo, and P. Galliano, Bioactive and ProtectiveSol-Gel Coatings on Metals for Orthopaedic Prostheses, Sol-Gel Science and Technology , 21(2001) 65–74. T.M. Sridhar, U. karnachi Mudali, M.Subbaryan, Sintering atmosphere and tempreture effects on hydroxyapatitecoated type 316L stainless steel ,Corrosion Science , 45(2003) 2337-2359. N. Saulacic, D. D. Bosshar kd. Groot, Clinical Application of Calcium Phosphate Biomaterials : A Review, Ceramics International ,19 (1993) 363-366. مجله دندانپزشکی دانشگاه علوم پزشکی و خدمات بهداشتی، درمانی تهران (17 )1383) 27-19. میثاق عزیزیان، سید محمود ربیعی، سلمان نوروزی بررسی اثر زیرکونیا پایدار شده بر ساختار نانو کامپوزیتشیشه-سرامیک کلسیم فسفاتی/زیرکونیا، علم و مهندسی سرامیک، 2(1391)19-16. S. Salehi and M. H. Fathi, Fabrication and characterization of sol–gel derived hydroxyapatite/zirconia composite nanopowders with various yttria contents, Ceramics International, 36 (2010) 1659-1667. D.A. Cortes, A. Medina, S. Escobedo, and M.A. Lopez, Biomimetic Apatite Formation on a CoCrMo Alloy by Using Wollastonite, Bioactive Glass or Hydroxyapatite, Materials Science, 40 (2005) 3509 – 3515. M.H. Fathi, A. Doostmohammadi, Bioactive glass nanopowder and bioglass coating for biocompatibility improvement of metallic implant, Materials Processing Technology, 209 (2009) 1385–1391. Hyuk-Nyun Kim, Steven W. Keller, and Thomas E. Mallouk,Characterization of Zirconium Phosphate/Polycation Thin Films Grown by Sequential Adsorption ReactionsDepartment of Chemistry, Pennsylvania State University, (1997). Balamurugan, G. Balossier, S. Kannan, J. Michel, J. Faure and S. Rajeswari, Electrochemical and structural characterisation of zirconia reinforced hydroxyapatite bioceramic sol–gel coatings on surgical grade 316L SS for biomedical applications, Ceramic International, 33 (2007) 605-614. T.Hanawa, Y.Tsutsumi, Calcium phosphate formation on titanium and zirconium and its pplication to medical devices, Bioceramics development and applications,1(2011)225-229.